Winter Advisory: Ski Right - to Avoid Common Injuries! By Angelo Ciminiello, M.D., The Sports Medicine Center at Danbury Orthopedics. Dr. Angelo Ciminiello of The Sports Medicine Center at Danbury Orthopedics, is a Board Certified Orthopedic Surgeon and fellowship-trained in sports medicine. "With the help of an orthopedic sports medicine surgeon, most injuries can be stabilized in the office and treated on an outpatient basis with excellent success." Dr. Angelo Ciminiello, a Board Certified Orthopedic Surgeon, is fellowship-trained in sports medicine. He served as assistant team physician to the Boston Celtics and Northeastern University, and is the director of Orthopedic Trauma at Danbury Hospital. His specialties include arthroscopic knee and shoulder surgery, complex knee and shoulder surgery, hip surgery, orthopedic trauma and fracture care. Dr. Ciminiello, a frequent speaker to the medical community and civic groups on sports medicine issues, is team physician for Ridgefield High School. 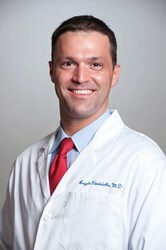 Learn more at: http://dortho.com/our-providers/physician-directory/438-dr-angelo-ciminiello. Winter’s here, and that means millions of snow enthusiasts will head to the hills. We’re lucky to live in the Northeast, with so many opportunities for skiing, skating, snowshoeing and snowboarding. But along with all that outdoor fun comes the risk of injury. While skiing fatalities are literally about one in a million, the rate of injury is much higher, ranging from minor sprains to serious ligament tears and broken bones. Any skiing enthusiast will tell you, this sport is a great way to enjoy some healthy exercise while you take in the beauty of nature’s winter wonderland. But … it’s only healthy exercise if you prepare properly. That means being well-trained, alert to snow conditions, and using your good judgement. Researchers estimate that about 600,000 people nationally are injured each year as a result of skiing and snowboarding – a decrease of 50 percent since the 1970s, thanks to improvements in training and equipment. Still, as a sports medicine specialist, every winter week brings me new patients with snow-sport related injuries. So with that in mind, here are some tips to help you ski safely and enjoyably. Skier's thumb, the most common upper extremity injury, affects the stabilizing ligaments on the sides of the thumb joints – usually the inside or ulnar collateral ligament (UCL). It often occurs when a skier falls and does not release the ski pole, over-bending and stressing the thumb. The pain will be your signal to see a Sports or Hand specialist! A partial tear of the ligament can be treated with a splint; a complete tear requires surgery. Reduce risk of skier’s thumb by letting go of your ski poles the moment you fall. Avoiding poles with saber handles or platforms can also decrease risk. Knee injuries comprise roughly 40% of all skiing injuries, with ACL (Anterior Cruciate Ligament) and MCL (Medial Collateral Ligament) sprains or tears being the most common. Knee injuries are usually the result of the snowplow position, when a falling skier hits the knee joint with excessive force. Skis crossing or stance widening too far can also lead to knee injury. Again, a splint may resolve the injury, but more series tears can require surgery. The best prevention tool here is conditioning your quads – see the workout recommended below. Proper maintenance and settings of bindings is also important. Avoid an overly-wide stance, and if you do start to fall, don’t resist. Head injuries can be fatal when skiing at high speeds. While helmets provide vital protection, it’s all too easy to end up travelling down the slope 2-3 times faster than the recommended range for best helmet protection. Of course, you should always wear a helmet, but you should also monitor your speed to stay within a safe zone. Also, as you would in a car, practice common courtesy and common sense to avoid collisions. Be aware of your surroundings and other skiers, look uphill and yield, and follow directions on signage. 1. Don’t overdo it, and forget trying to impress your friends. Start out on easier terrain and improve your skills gradually. And even before that, get in shape with proper training. 2. Follow the skier’s “code of conduct” – the common-sense rules you see posted on the slopes. They are for your protection, and the safety of others. 3. Pay attention when getting on and off the lift – it’s prime time for injury. 4. Take breaks. Sure you want to maximize your ski time. But injury rates increase with fatigue. Rest when you need to, and stay hydrated with water or sport drinks. 5. Take the fall; fighting it is how ligaments get torn. If you can, sit down to break the momentum. 6. Take it from a pro. That is to say, take a lesson to improve your technique and nip bad habits in the bud. You should see your doctor whenever you sustain any type of injury. Skiing injuries can usually be treated without operative intervention, but should always be evaluated to avoid the possibility of long term damage. With the help of an orthopedic sports medicine surgeon, most injuries can be stabilized in the office and treated on an outpatient basis with excellent success. Before you venture out, get in shape! Quads: Quadriceps are the main muscle group for skiing; they maintain your stance and protect your vulnerable knees. To condition them, try squats and lunges. Glutes & Hamstrings: The flexed, forward-leaning position of downhill skiing requires great strength from your hamstrings and glutes. Good preparation includes deadlifts, one-leg dead lifts, step-ups and hamstring rolls on an exercise ball..
Thighs: Inner thighs keep skis together, while outer thighs provide stability and steering. Good prep here includes side lunges, inner and outer pushes on abductor/ adductor machines, and squeezing an exercise ball between your knees. Calves: Calf muscles provide the power to keep you upright over your bent knees. Strengthen them with calf raises, seated or standing. Abs and Back: Skiing in the proper flexed, bent position puts stress on your back. Strengthen your core to prevent spinal injury with bicycle crunches, medicine ball twists and lateral pulls. Arms: For push-off power and stability of shoulder joints, work those biceps and triceps as part of your ski prep routine! Now that you know the ups and downs of safe skiing, get out there and have some good healthy fun! Danbury Orthopedics is a multi-specialty practice staffed by leaders in orthopedic care since it first opened in 1954; the practice is a member of Western Connecticut Orthopedic Specialists, along with New Milford Orthopedics and The Hand Center of Western Connecticut, providing comprehensive care to the community for over 90 years. The practice’s Centers of Excellence provide integrated treatment, offering individualized and compassionate care by a team of specialists. The goal of the practice is to help patients regain mobility, lead active lives and attain optimal well-being. To make an appointment with Dr. Ciminiello, or learn more about Danbury Orthopedics, please visit http://www.dortho.com/ or call 203.797.1500.